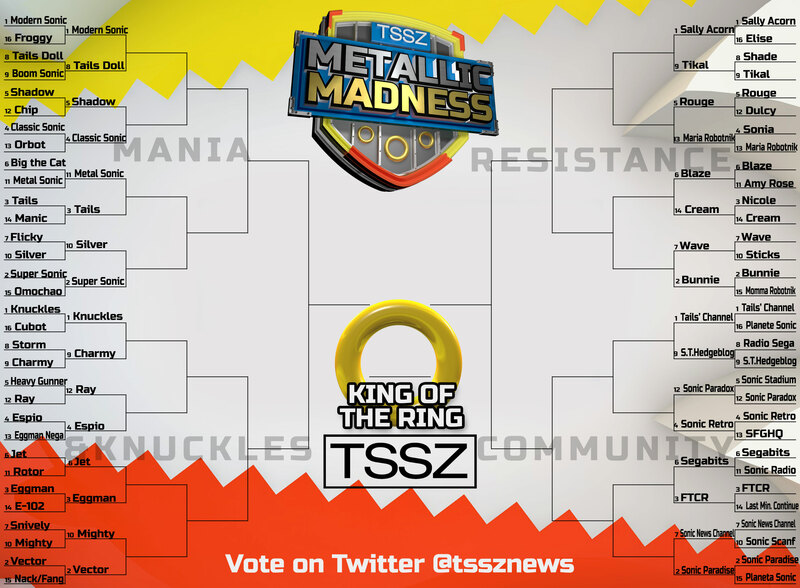 Day 2 of Metallic Madness on our Twitter feed was one for the upsets. A total of six matches ended in upsets with the hundreds of votes cast today. People love Maria. There’s been a lot of positive feedback to the addition of Maria to the tournament this year. She decisively defeated 4 seed Sonia in the make-up match today. Tomorrow evening, she will face 5 seed Rouge, which in theory is an easier match. Could Maria be on the way to a battle royale with division champion Sally Acorn? People love Tails more. An interesting story: Last weekend we may or may not have joked on Twitter that Tails dies in Sonic Forces. Today, we learned Knuckles, Amy and the Chaotix are confirmed NPCs in Sonic Forces, with no mention of Tails. At least he’s alive in our tournament, with the largest margin of victory so far. He’ll face 11 seed Metal Sonic this Sunday. Tails Channel and Find the Computer Room don’t want to win, but one of them probably will. Both fan sites have been very vocal about their desire to not be in the tournament, but there’s a reason they are the 1 and 3 seeds respectively. With strong fan bases for both sites, they appear to have a clear path to face each other in the division final next week…unless Sonic Paradise, the breakout hit last year and 2 seed this year with fans who vote, has anything to say about it. With round 1 sorted, let’s give you the voting schedule for this weekend. All times are eastern (ET). Remember: Voting only takes place on our Twitter feed, and lasts two hours a match.